I was beside myself when I heard ZUN was going to continue Renko and Merry’s story at Comic 1☆6, and here we are, not four months later with yet another ZUN CD! If anything, I’m sorry I couldn’t get this out sooner. Enjoy! I ignored the line breaks in the dialogue in my translation. The cost is a slight loss of dramatic effect, but it’s easier to manage. You would normally read 伊弉諾物質 as Izanagi Busshitsu, however throughout the text it has “イザナギオブジェクト” as its reading, i.e. “Izanagi Object”. “Cell phone coverage” – is more generalized as “electromagnetic waves”. Radio/Television/Satellite/Cellphone etc. I translate 療養 as “treatment”, but it specifically refers to a sort of “going out into the country until you feel better” kind of treatment for those of a weak or sickly constitution. Given that it takes you away from the polluted air of the cities, it’s not a completely mindless sort of way to get better. “Zen’kou-ji Temple” is redundant as the “ji” means temple, but I figured it would be less confusing this way. “…in front of a statue of Yama” – Yama is the Sanskrit and Pali name for “En’ma” I have leaned towards Sanskrit and Pali terms over Japanese equivalents throughout the rest of the translation as well. “the god that created the Japanese archipelago” – literally it is written as “birth”, but Izanagi is male, and created the islands with Izanami (female), so I used “created” instead of “birthed” to avoid confusion. Although I’ve read the myth before, I forget the details (it’s quite complicated and graphic). I will not translate youkai. If you don’t know what they are yet, head on over to wikipedia. I chose to keep “Izanagi Object” capitalized as a single unit, rather than “Izanagi object”, mainly to keep it emphasized. Now without further ado, I give you the 6th narrative addition to the Hifuu Club, Izanagi Object, Neo-Traditionalism of Japan!! The cityscape was lined with a forest put up just for show, a result of environmentalism gone too far. There was no natural plantlife, just a jungle that looked like it came right out of a picture book. These days humans would create “nature”, and imagined they had complete control over it. It was only a matter of time before anything outside of this control would be denied outright. Now, there was a highly probable way to cure almost any illness. Things such as some hereditary disorders that just could not be cured were now considered not diseases but rather “traits”, and society had adjusted to this view. And thus, there was no sickness that could not be cured. Ever since Maribel Hearn (Merry) was wounded at the Torifune Ruins, she was affected by an unknown illness. At any rate it was determined that she was suffering delusions due to the effects of an extraterrestrial virus. Given that society tends to fear things it has no control over, Merry was quarantined in the name of “treatment” at the Shin’shuu Sanatorium. Now Usami Renko, having been notified that Merry had completely recovered, had come to pick her up. Goslings Lead the Geese to Water. 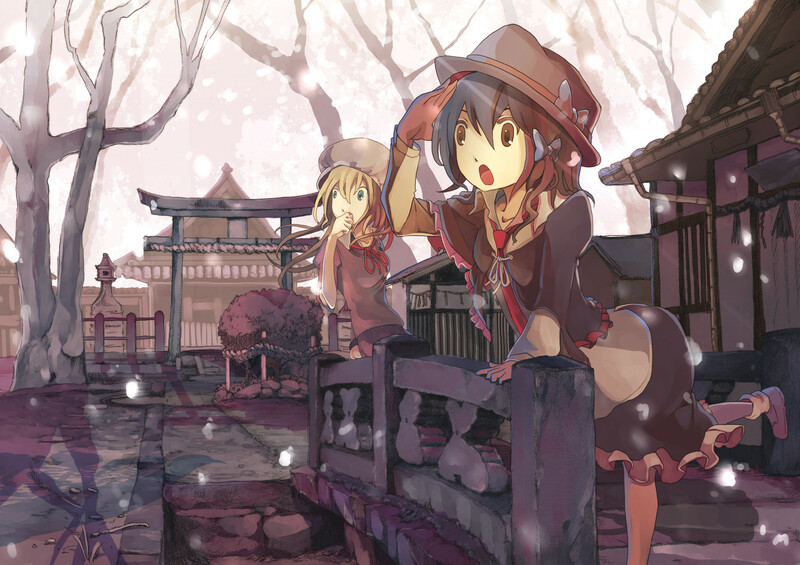 After Merry was discharged and while they were in the area, Renko and Merry decided to go sightseeing through Shin’shuu. Their first stop was at the Zen’kou-ji temple, where they planned on visiting Japan’s oldest image of the Buddha. There was nothing new about the main shopping street that ran through the shrine, packed as it was with visitors. As the world of souvenirs was bound by tradition, it was like time had been stopped there for over a hundred years. –The Zen’kou-ji Earthquake struck the northern districts of Shin’shuu in the fourth year of Kouka’s reign (1847). The Zen’kou-ji temple was famous for showing it’s hidden image of the Buddha only once every seven years, and during that time the temple would be flooded with people from all over the country. Since the Zen’kou-ji earthquake struck right in the middle of the ceremonial unveiling, the damages dealt by that powerful earthquake were catastrophic, and it is said that the dead numbered in the thousands. But Merry had seen it, the landscape wrought by a frightening earthquake that would easily have twisted that pillar. Lately, Merry was not just seeing gaps in the boundaries of worlds, but seeing beyond them into the worlds themselves. And it wasn’t just in dreams anymore, there were cases where she actually went to the places she saw, and that was making her a little worried. Then there was that time at the Torifune Ruins, just a few days before. It might have been just a dream to Renko, but it was real for Merry. After all, she was the only one who was wounded. The real reason she was put in the sanatorium was probably because it was determined she had some kind of psychological anamoly. Of course that wasn’t the case, but society just isn’t receptive to strange persons. Therefore, Merry must keep her ability secret, as some element of the occult. Renko and Merry were standing in front of a statue of Yama. Its face was depicted bright red and in anger, but to them the statue just looked like a random old drunk. What lies forty thousand yojana underground is the bottom of Hell. Actually, Hell is about thirty nine thousand yojana high. That means that Hell’s ceiling is far closer, just a thousand yojana from the surface. Converting to metric puts that at about seven thousand kilometers underground. In other words, close to the center of the earth. Merry didn’t know that much about the inside of the earth, but if she were to believe that Hell really exists, the anxiety that surely one day she would find herself there crossed her mind. After all, Merry was carrying with her something that made her feel that way. Merry continued the conversation, trying to conceal her anxiety. ”Since ancient times, as long as there have been humans, there have existed ‘hells on earth’. It may be that people imagined paradise to be far greater than their hells as a way to quell their fears. Yet, the real hell lurking under the earth still remains in silence. 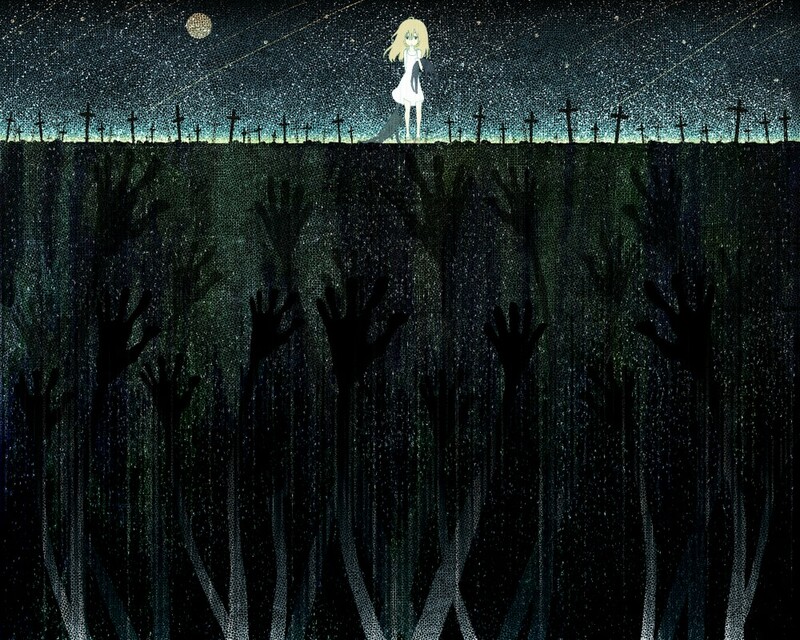 Merry didn’t tell Renko, but when she was undergoing “treatment” in the sanatorium, she experienced a strange world that lay far beneath the surface, in the depths of the earth. There was that entrance to a cave, filled with the frightening stench of death. It reminded her of Yomotsu-Hirasaka as it was described in the Kojiki. Merry was still carrying the strange rock fragment that she found while she was there. For some reason when she held it, several landscapes crossed her mind, appearing and then vanishing just as quickly. Merry intuition told her that some secret lay beneath the earth, and that it was somehow connected with with origins of this country – some incredible secret. The Izanagi Plate was the ancient tectonic plate which gave rise to the Japanese archipelago when it ran into the Pacific side of the Eurasian Plate. Twenty five million years ago it was completely submerged under the Eurasian continent and disappeared. Its name comes from the god that was said to have created the Japanese archipelago. Merry looked as if she had made up her mind. Renko looked on as Merry was getting all excited about something. She kept on muttering things like “Izanagi was real…” on and on. It was as if Merry was going off somewhere all by herself and Renko started to feel lonely. Come to think of it, recently it felt as if Merry’s abilities were getting stronger. At first, they had enough fun just with the chance at a glimpse of strange new worlds, but now they were bringing things back from those worlds, as if it were nothing. In those strange worlds they had sometimes encountered beings like youkai. 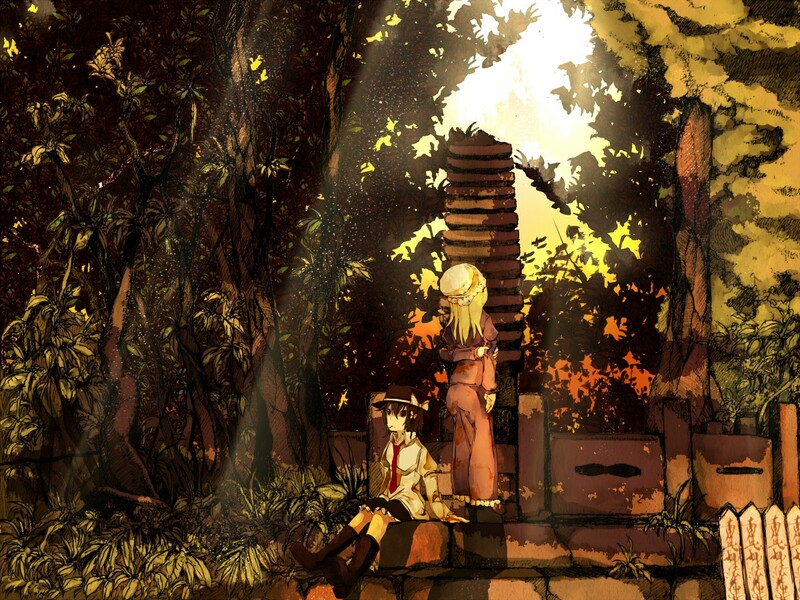 To Renko those were just figments of her imagination, but to Merry, they were real. Renko couldn’t help thinking that Merry was on the same level as those youkai. Merry held out a small rock. Its shape was something like a fishing hook and something like a key. It was hard to describe, but it was clearly man-made. Since Merry came back from the sanitorium, it looked as if her senses had sharpened to a whole new level. While Renko felt a bit jealous, she hoped that somehow she too could see what Merry saw. When was it that people stopped accepting mysterious things? When will o’ wisps appeared, people once thought they were the regretful spirits of the dead, or fires which foxes used to deceive humans. In those thoughts was a deep sense of imagination. Even as science advances, the power of imagination does not grow any less important. The better half of science is still based on imagination. In order to explain those will o’ wisps, we imagined that perhaps those they were natural combustions of phosphorus gas, perhaps they were plasma, perhaps they were some sort of hallucination caused by the inner workings of the brain. However, as this society built on information advances, the power of imagination has been all but extinguished. In this age where information is equally available to anyone, there is no room left for imagination. People have taken great pleasure in finding the answers to great mysteries, and have denied the mysteries that have no answer. That is why they all have vanished from this country. Now, all of Japan is but a graveyard for the gods. Merry had put her hand over Renko’s eyes. By doing so, although it was a bit unstable, Merry was able to share her vision with Renko. All of Merry’s anxiety was gone. The land under the earth that she had seen wasn’t Hell. What she had seen were images of the world of the gods, a place that actually existed. Their imagination knew no bounds. So they started off, taking in the graveyard of the gods as factual history. It was what the members of the Sealing Club, those who accepted inexplicable mysteries, could see… a different Japan. How do you do, it’s ZUN. It hasn’t been that long has it? I’m actually from Shin’shuu, and have been to the Zen’kou-ji temple in Nagano several times. There is a pitch black passageway inside of the temple where it’s so dark you must find your way through hand and foot, and it is used in a certain set of monks’ trials. No, no. It really is pitch black in there. If an incident happened in that passageway there would be absolutely no eyewitnesses. The whole point is that if in the middle of the dark passage you can grip the lock of paradise, it’s “mission clear”. That’s the way it usually is, but there was one time when there were lights on inside of it. I think it was during one of those once in seven years ceremonial unveilings. It was terribly crowded, so they must have done it out of safety concerns. It was really disappointing to me at the time, like I’d lost some of my innocence. But looking back now it really was a valuable experience to me. After all, I still remember clearly what the lock to paradise looks like, and that’s not something you see everyday. Ah, that really has nothing to do with the music CD does it? This story was just one of those adventures the two members of the Sealing Club often have. ^I was tempted to make this first image, but I figured I’d continue with tradition – it’d be weird to have a non Merry and Renko image at the top. May I use the Japanese story’s texts , in my blog? A link back would be cool, but you don’t have to if you’re not using the translation. Already !? Thanks ! Looks like Marry become more powerful with her new skill. Thanks for the translation. Gensokyo is getting closer it seems.